We just can't seem to resisit when it comes to pottery. Every year our selection grows. 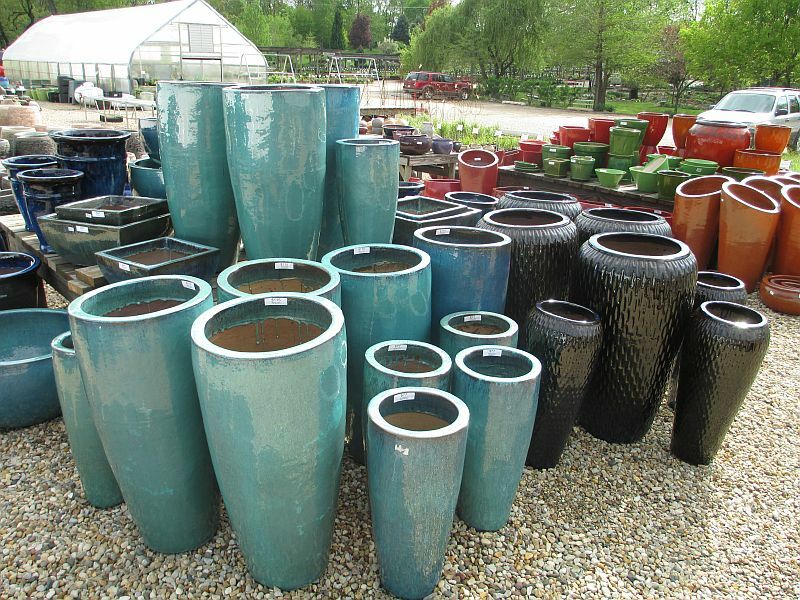 Some of the pots are quite large, and will make an artistic statement in the garden all by themselves. Others can be used as planters, troughs, or fountains. Some will make great holders for grass bouquets. Although most of the pottery that we sell is “freeze-proof”, you still need to take precautions to avoid winter damage to the pottery. The safest thing to do if you are going to leave the pot outside is to empty it and turn it upside down. Some come with drainage holes already, but many do not, since some people want to make fountains, or otherwise hold moisture inside the pot. A masonry bit can be used to add drainage holes, and we can do that for you. We are especially excited about “Pebble Pots”, which are concrete pots with black or colored pebbles embedded into the concrete as they are created. The larger Pebble Pots come with the necessary plumbing so that they can be set up as “bubblers”. Bubblers are pots set upon a basin, which can be hidden in the ground if desired, with water bubbling up in the center of the pot, flowing down the sides of the pot, and into the basin, where a pump recirculates the water to the top again. After seeing how the plumbing works on these Pebble Pots, we have figured out how to turn nearly any piece of pottery into a bubbler. Those pots with some texture on their surfaces make excellent bubblers.